Description: Ms. Main requested a website (or websites) that she could use for her co-op and French classes. The most important function that she needed was the ability to upload documents for student access and download. She wanted to upload homework take up on the site so that her students could check their work at home instead of using class time with homework take-up. She also liked the idea of a forum where her students could make inquiries and interact with each other from home. Ms. Main was also more interested in functionality than being able to change the look and feel of her website. We had some difficulty deciding on a platform because Ms. Main hadn't had any previous experience with the four different websites we had resources for. With the use of the Websites Technology resources, she narrowed her choice down to AW 3.0 or Moodle. We eventually decided that AW 3.0 was the better platform choice because it met all her needs while not being a very difficult site to use. It was a good fit because she only wanted basic functionality, with as little maintenance time as possible. Using Academic Workspace 3.0, we created two separate sites (one for co-op and one for French) for her use. Since she had very little previous experience with Academic Workspace, if any, we created a Google Document outlining the basic steps for the four functions of AW (announcements, calendar, forums, and student documents) for her to refer back to. Alternative possible uses: Academic Workspace 3.0 is one of the easiest and most intuitive website platforms to use. It is very ideal for teachers because it was developed by the TDSB for that exact purpose. Also, sign-ups are not required for teachers nor for students, because everyone already has a TDSB account that they can log into from home, and at school. We recommend AW 3.0 for teachers (in any subject) that have very little experience with technology, are not concerned about changing the aesthetics of the site, and only have use for the basic features of a website. It is a useful site for teachers to keep their students updated using the announcements and calendar, and upload class notes, handouts, assignments, etc for student download. The TDSB accounts also allow teachers to monitor which of their students are using the site. But AW 3.0 is not a good fit for teachers that need more than the basic functions, because this platform is very limited. 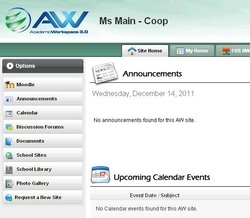 Our Resources: Here is the AW how-to instruction Google Document we created for Ms. Main.